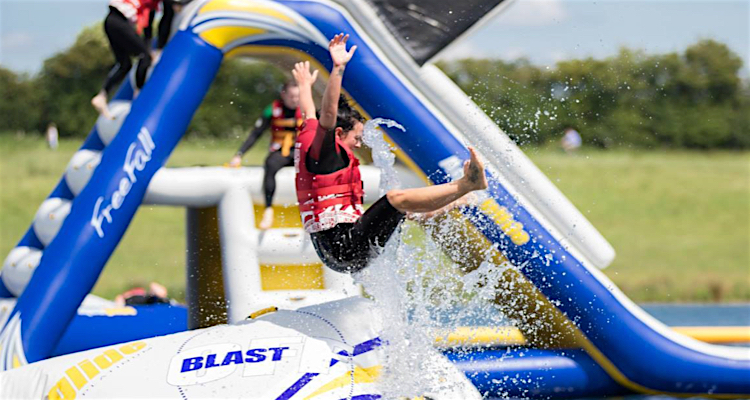 Home General Experiences Make a splash at the best outdoor inflatable water parks in the UK! 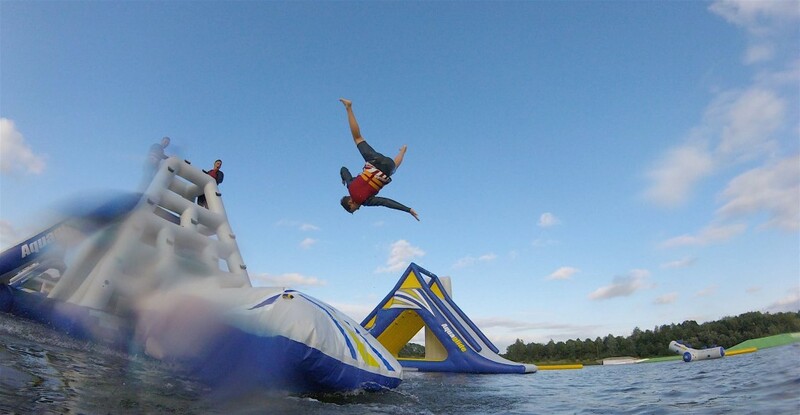 Make a splash at the best outdoor inflatable water parks in the UK! If you love playing in the water you’ll love the new inflatable water parks that are quite literally springing up all over the UK. We take a look at what these inflatable water parks are all about and give you the rundown on the best inflatable aqua parks in the country at the moment. What is an inflatable water park? They’re a different take on the traditional aqua park that you’ve probably been to at an indoor leisure centre/swimming pool. Rather than flumes, lazy rivers and toboggans that rely on fast flowing water, this new generation of water park is more akin to a floating obstacle course. 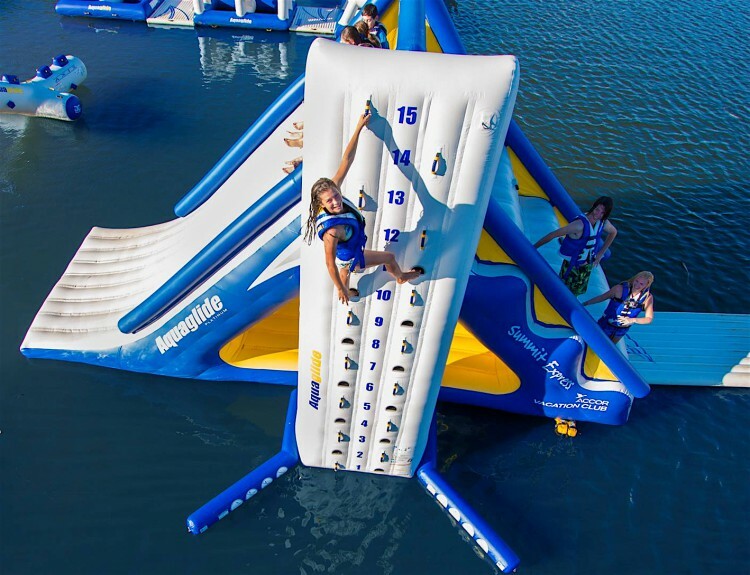 Often located on freshwater inland lakes or even the sea, the idea is that these inflatable water parks are modular and interconnected, so you can run around in a circuit, tackling obstacles and challenges as you go. There’s everything from slippery walkways, slides and swings, to trampolines, catapults and quarter pipes. So where can you find these inflatable water parks in the UK? Every summer there are more and more inflatable water parks opening their doors at venues around the UK. Here’s out lowdown of the best to date. Lagoona inflatable water park near Reading – giving Dubai a run for its money! Claims to be one of the largest inflatable water parks in the world (after Aqua Fun on Dubai’s Jumeirah Beach Residence). Whilst the Dubai’s seafront version might be with that impressive skyscraper backdrop, it also costs a small fortune (approximately £32). 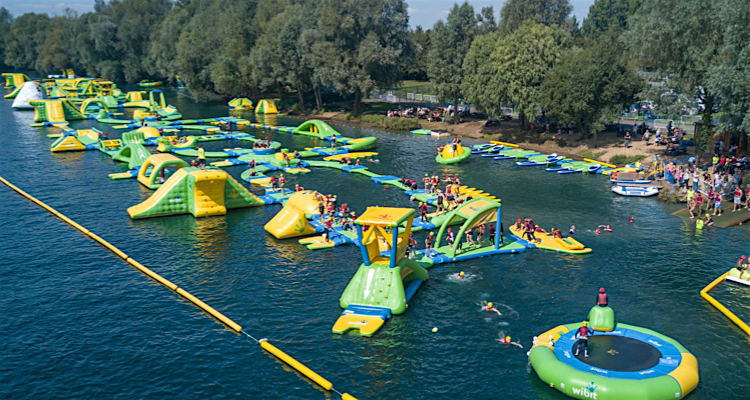 The impressive Lagoona Park covers an impressive 3700m2 on a 25-acre lake and there’s currently a special offer of two Lagoona Aqua Park tickets for just £25, rather than the £15 per person standard fee. Boiinnng! Making a serious splash at the aqua park. You will be getting wet at Rutland Water! On the north shore of this huge reservoir at Whitwell Creek, this is also one of the largest inflatable parks in the UK. It’s a lovely location for your inflatable fun on the water. As well as the interconnected runs, there are some pretty gnarly stand alone cliff and slide modules. They also run special timed sessions for accompanied six and seven year olds, so little ones can have go without the big kids getting in the way. Opens from around the end of May to the end of September. This inflatable water park has been designed by Wibit, one of Europe’s leading aqua park design and build specialists. It’s a really clever layout here near Slough, with four different interconnected areas, all increasing in difficulty level as you go. There are some pretty big modules here. Onshore facilities are excellent too, as it’s a well-established water sports centre offering cable and boat tow wakeboarding and waterskiing, so you can have a full day of action watersports. 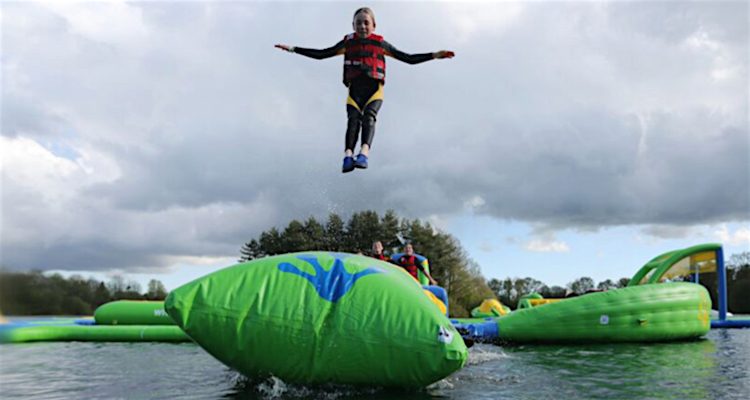 Inflatable water park comes to Manley Mere lake near Chester and Warrington. Part of the sailing and paddle sports centre, the aqua park has a dedicated area on the lake. Whilst this inflatable park can’t boast of being the biggest, there are some good modules and lots of other activities on site that you could combine your waterpark session with. On water sports include paddle boarding, kayaking and sailing, whilst on land there’s and adventure trail. Spectators will love the Chameleon Cafe Bar and Restaurant. 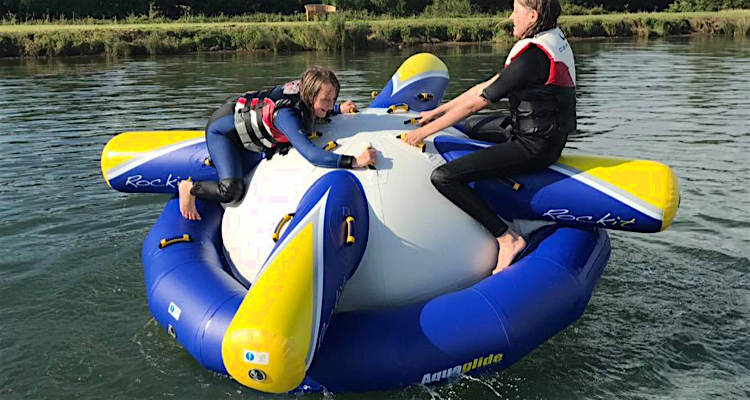 Enjoying a location on the edge of the New Forest National Park, this inflatable water park on the lakes south of Fordingbridge is proving a popular attraction on top of the already established cable tow and paddle sports offerings. As well as the large-scale park for all ages, there’s a separate inflatable water park just for kids. It’s a figure of eight pattern and offers ‘easy obstacles for young conquerors’. Great for little ones to build their confidence and is open only for kids aged between six and 14 years. The Sheffield Cablewaterski centre has been around for years. It’s the north of England’s largest cable tow, attracting wakeboarders, kneeboarders and water-skiers from all the country, with an impressive wake park too. Now there’s more waterborne fun with ‘the largest inflatable aqua park in the north’. A well-established set up, with some great modules on a corner of the lake that’s close to the pontoon (not as far to swim out!). Good onshore facilities too. They are all outdoor and vary in size, but the concept is the same – you buy a ticket and you get a timed session (usually 45 to 60 minutes) to play on the park. They’re usually open from around the end of May to September or even later. – Gear. Wetsuits are obligatory at some inflatable parks in the UK, optional at others. Some include wetsuit hire in the entry fee, others charge locally. We’d recommend a wetsuit even if the water is warm, as it helps protect from the seams, velcro connections of the modules etc You can also wear wetsuit boots or go barefoot and swim goggles if you wish. Most offer soft helmets for under 16 year olds to wear. – Height and age. Again, restrictions may vary from park to park, but in general it’s 8 years old or 1m30/1m20cm height minimum. Under 16s will need to be accompanied by an adult (usually max of three kids to one grown up). And in case you were wondering, inflatable parks are as much for children as they are for adults! 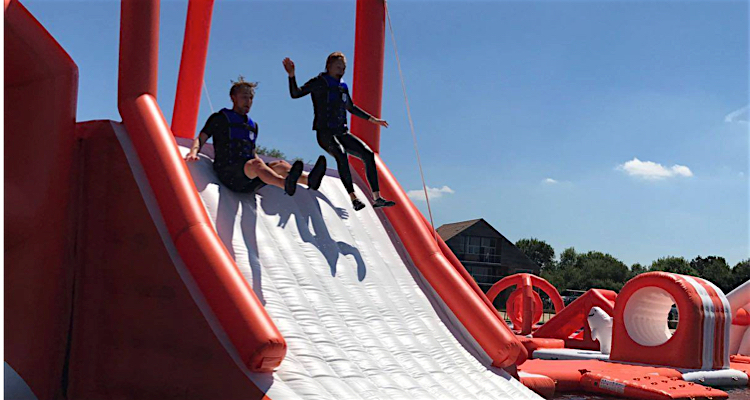 And if you still can’t quite picture what these inflatable water parks are all about, here’s a great ‘customer journey’ video courtesy of Aqua Park Rutland for you. Stuffing The World – What Is Taxidermy?